With the launch of the Snapdragon 820 and the chipset finally starting to appear in handsets, its time to take an early look at what scores Qualcomm’s latest flagship offering can get. Benchmark scores are after all used as a layman’s approach towards judging the performance of any processor or GPU so lets take a look at what the processor comes with. After all, Qualcomm’s got quite a lot to make up for after the dismal performance of the Snapdragon 810 and by the looks of things so far, its successor should make up. When compared to its predecessor, the Snapdragon 820 comes with several changes on board. For starters, it’s the first Qualcomm processor that focuses exclusively on custom cores; an approach completely different from the one that the Snapdragon 810 took, and we saw how badly the processor’s power management issues were handled. This year, the Snapdragon 820 comes with two core clusters of Qualcomm’s custom-made Kryo cores, which, in addition to solving the aforementioned throttling problem, also bring back Krait, indicating that the company’s quite comfortable with playing its strengths. The two core clusters of the processor clock at 1.5 and 2.1 GHz respectively, with two more alleged L2 caches of 512KB and 1MB. Other specifications aren’t known as of now, but as the processor starts to flow in the market, we’re bound to find out sooner than later. That being said, today’s scores of the Snapdragon 820 don’t paint as much of a dominating picture as we’d like Qualcomm’s latest processor to paint. In pure performance benchmarks, the processor, on board the Xiaomi Mi5 comes fourth place when stacked against the Kirin 950, the Exynos 7420 and even the Snapdragon 810. To be fair, the Xiaomi Mi5 on which the Snapdragon 820 is running doesn’t seem to have optimized its browser performance for the chipset’s custom Kryo cores, so we’re sure that the processor has plenty of potential under the hood. But, the browser scores of 5890 aren’t that much different from Qualcomm’s reference platform, with Chrome and Xiaomi’s stock browser showing little differences in overall scores. The Snapdragon 820 does however make a comeback in writing and video playback scores, with the chipset coming second only to Huawei’s Kirin 950. To recap, the Kirin 950 comes with two sets of ARM’s Cortex A53 and A72 cores, clocked at 1.8 and 2.53GHz respectively. It’s received similar benchmark scores in the past as well, so Huawei really seems to be getting it right on multiple platforms it seems. The Snapdragon 820 also beat both the Snapdragon 810 and the Exynos 7420 by a large margin in writing scores, showing its true potential and rendering both the chipsets effectively as second tier in terms of scores. Its lead over the Snapdragon 810 is particularly impressive, with the chipset more than doubling the scores of its predecessor. It barely leads over the Snapdragon 810 in video playback however, as you can see in the second image above. A number of factors can be said to have caused this, the first being the fact that it’s the Xiaomi Mi5 running the Snapdragon 820, so any judgement should be reserved until future tests on other devices have also been carried out. 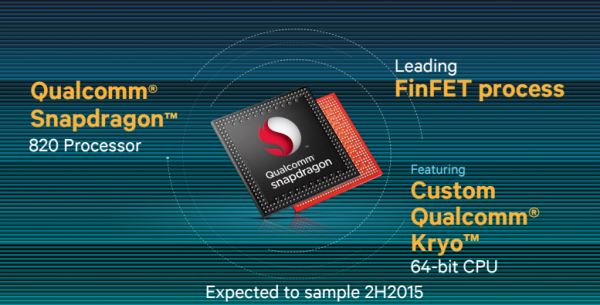 Coming towards GPU performance, its once again Qualcomm’s Adreno lineup which shines throughout. Photo Editing scores of the Xiaomi Mi5 are above par to put it simply, beating the Kirin 950 by nearly a margin of 3000 points and the Snapdragon 810/Adreno 430 by 3500 points. Qualcomm’s got the GPU equation hammered down it seems, so if you’re looking for some top quality graphics performance, don’t be hesitant to give the company a shot. Another interesting feature of the Snapdragon 820‘s performance is the power consumption and load increase for the processor. Single core CPU load for the processor stands at 2055 mW, which is rather high when compared to reading of 1387 and 1619 mW for the Kirin 950 and the Exynos 7420. It’s also outmatched by the Kirin in per core load increments but once again given the preliminary nature of the tests, nothing can be said for certain as of now. Moving towards Manhattan and T-Rex Offscreen scores, we see the Adreno 530 nestled comfortably at the top once again, with scores of 47 and 91 frames/second respectively. These are within the ballpark of Qualcomm’s reference scores as you can see, so strong GPU performance shouldn’t be an issue with the Snapdragon 820. Interesing appearances here are the Apple iPhone 6s Plus and alleged Galaxy S7 Exynos 8890 scores, both of which fall far behind the Adreno 530. But, before you get your hopes high too much, keep in mind that the Xiaomi Mi5 did report temperature spikes when running the GPU tests. Given Qualcomm’s bad history with power management and throttling, battery performance should be a significant issue when using your Snapdragon 820 powered device for intensive graphics performance. We’d be interested to see how the Samsung Galaxy S7 and Galaxy S7 Edge fare in these tests, with their massive batteries. That ends our look at how well the Snapdragon 820 stands against some other processors out there. Thoughts? Let us know what you think in the comments section below and stay tuned for the latest.